Etched with Lions and Gryphons and Other Crazy Beasts! The Knight's Templars of the early Medieval period was a powerful organization. So powerful that the Pope, himself, arranged to have many of its most powerful members captured, tortured and killed in a horrific assault that began on Friday the 13th, October 1307. But these powerful knight came from humble beginnings, and this sword attests to both their poverty and opulence. The Sword of the Templars is richly gilded and ornamented, but on its pommel is the humble seal of the Knights Templars: Two knights sharing a horse. These two knights are rumored to be none other than Hugues de Payens and Godfrey de Saint-Omer, two of the founding members of the Christian order of knights. The rumors say that the Templar Knights were so poor that they could only afford one horse for every two knights, so the poor saps had to ride into battle like children doubling up on bikes. But the knights grew in power and wealth, eventually setting their sights on an autonomous kingdom for themselves. This opulence is symbolized by the meticulously sculpted guards and the richly decorated grip. And gryphons. Because only rich people put griffons on their stuff. 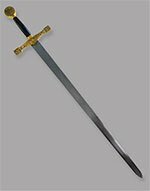 The Templar Sword is a beautiful piece of historically based artwork. It bears a 32.5-inch stainless-steel blade that is smooth and perfect for engraving. 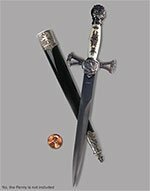 The black leather scabbard bears ornately carved and gilded collar and tip. If you're looking for a stunning piece of historical art to stare at, then check out Kate Moss. 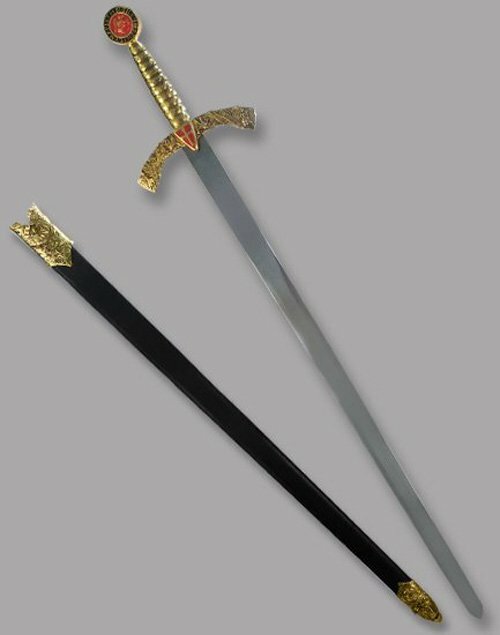 And, when you're done staring at her, buy this sword because it's absolutely stunning. 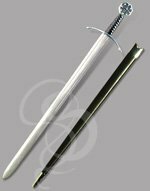 Better yet, click on the "Engrave This" button and use our online engraving utility to personalize this sword with custom text and graphics! Other Materials:Sculpted brass guards and pommel. 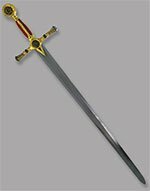 The Templar Sword comes with a gilded leather scabbard.